A lot of Manchester United fans are fed up with the way that Louis van Gaal has handled the squad during his time as manager at the club. A lot of talent has been sent out the door and a lot of talent has been brought in. But has there been any progress? Wouldn’t the squad been better off if van Gaal never sold or bought a single player? It probably would. All these transfers since Louis van Gaal got the job as Manchester United manager has caused a great amount of distress not only amongst the fans, but also in the squad. Robin van Persie, Rafael, Nani and Chicharito has all been critical about the way van Gaal handled his players after their departures. Most of these former United players has found new success in their new clubs, especially the lethal Chicharito. Van Gaal had his reasons to let these players go. But it all went too fast, and it feels like van Gaal approached the transfer market like a gambler betting on roulette. It’s not only the fact that van Gaal brought in expensive players that never really settled and make an impact. That happens in football every year. The main concern is that van Gaal seems to have almost a complete disregard of the balance of the squad. In the beginning of the van Gaal-era the defence was one of the weakest and most vulnerable in the Premier League. Today the defence is solid. But the cost of that has been to force a good passer and a ball distributor in Daley Blind to play as a centre back. Sure, it works if your ambition is a top six finish in the Premier League. But most Manchester United fans wants more than that. The fans appreciate Blind who gets the job done. But when your predecessors are players like Vidic and Ferdinand you’ll get compared to them whether you like it or not. Another talent that is being wasted is the talent of Juan Mata. He has far too often been forced to play as a winger. His best position is as a playmaker. But van Gaal doesn’t agree. Otherwise he wouldn’t think of playing a natural winger in Jesse Lingard as the playmaker instead. He has also favoured Memphis over Mata in the playmaker role numerous times. And Memphis is nowadays spending most of his time on the bench even though he had a hefty price tag of £25 million. And then we have Anthony Martial. Is he a winger or a centre forward? Nobody knows. Martial is talented and handles whatever role his given well. But one can only wonder what is best for the development of his great talent. It would probably benefit him if he could continuously play in his favoured position. Ander Herrera is another man who has been played out of position many times though nowadays he is usually deployed in his preferred position. But recently he rarely gets to play anyway even though he was brought in for close to £29 million. Marouane Fellaini had a weird spell in the team a while ago where he played as a defensive midfielder, an attacking midfielder, and as a striker. For a while he was Manchester United’s best attacking point. But when the other teams figured out that the main attacking idea of Manchester United was to play high balls on Fellaini, his threat was immediately neutralized. There are more examples. When Valencia and Young plays they often are deployed as full backs. Michael Carrick is a step-in centre back and Wayne Rooney had to fill the gap in centre midfield for a long time and when he finally got to play as forward again, it seemed like he had lost his touch in front of the goal. Injuries aside, a lot of these instances where players are forced to play out of position are consequences of an imbalanced squad. It would probably be close to impossible to keep the squad intact after David Moyes departure, but for the sake of argument, wouldn’t the old David Moyes squad be a more balanced one and on the whole a better one? David de Gea in goal with Evra, Vidic, Smalling and Rafael as the back four. Young, Carrick, Mata and Nani in midfield in a diamond formation with Rooney and van Persie up front. That would be an aggressive line up and require defensive responsibilities from Rooney, but I’m sure it would be better than the current line up. And with Hernandez, Fellaini, Zaha, Kagawa, Keane, Fosu–Mensah, Blackett, Jones, Lingard, Cleverley, Fletcher, Welbeck and Januzaj as back up, it sounds like a healthy and balanced squad. Van Gaal has made a lot of changes, but no progress and it definitely feels like a lot of talent and time has been wasted with all these transfers. You forgot to mention Di Maria brilliant with Madrid and reaping the benefits of playing for Paris St Germain. What did van Gaal get out of him? 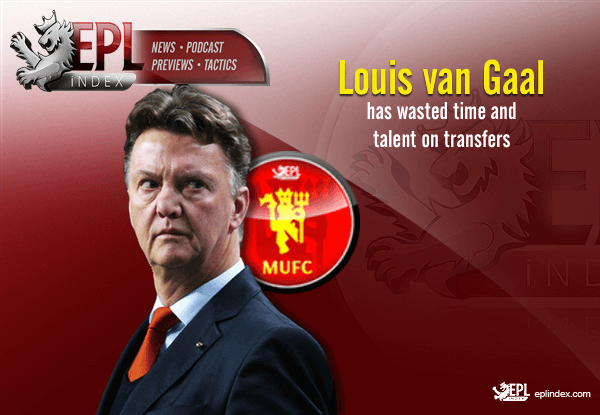 A loss in transfer fees and one season of ignorance from van Gaal. Progress seems to be a step backwards for him, retention needs to be productive and this season United have scored less goals than games they have played. What a legacy for next season, IF the board persist with him. It’s pretty disturbing that LVG has destroyed the sense of United being a big club. I always felt that when Everton, West Ham or Tottenham faced United they had so much respect for the team that even though they had a good winning streak themselves, they crumbled under the pressure. Now it’s the other way around. United look at a team like Southampton like they are Real Madrid or Bayern Munich. No, they are Southampton and it should be three points. Sure, we can’t win them all but there’s just no more excuses for this level of football. What more does LVG need? Buy the top players from other teams in PL? Aguero + Coutinho + Stones + Koscielny + Mahrez + Kante + De Bruyne? I’m not even joking that even though LVG got them all a top 4 finish would be really, really difficult to achieve. Categories: EPL Index Featured Article, EPL Index Opinion, Manchester United, and Manchester Utd (NN).' 'Tags: "Manchester United", Louis Van Gaal, and MUFC. Are Manchester United Better Than Last Year?